*This post is one great big spoiler. There’s a neat villain bait-and-switch in the 1954 drama The Caine Mutiny. This film, based on the novel by Herman Wouk, is about a crew on an aging minesweeper during WWII. The script cleverly muddies the waters (ha ha) as it resets the parameters of villainy. When the tired, caustic captain of the Caine is replaced by a new spit-and-polish leader (Humphrey Bogart), we expect a little friction from a crew unused to strict navy procedures. What we do not expect, though, is a mentally-unstable Bogart who won’t accept responsibility for his errors, and chastises crew members for minor infractions – whether real or imagined. The movie would have us believe Bogart’s character is the villain, but Bogart the actor doesn’t entirely play it that way. He presents a man who is fearful, confused and easily panicked. He also has his pet obsessions which make crew members (and we the audience) feel apprehensive. It is the ship’s Communications Officer (Fred MacMurray) who first becomes wary of Bogart’s mental capacities. He eventually convinces the Executive Officer (Van Johnson) that Bogart might be paranoid and unfit for his post. Johnson agonizes over his loyalty to navy regulations vs. the worrisome behaviour of his commanding officer. It is during a wild storm at sea when Bogart makes bizarre decisions that put his ship and his crew in jeopardy. Johnson finally relieves Bogart of his command and, in doing so, ensures the crew and the ship survive. Upon return to the U.S., however, Johnson faces a court martial for mutiny. It is during this trial that we realize the villain wasn’t Bogart after all. It was our chum, MacMurray, who kept us laughing with his witty one-liners. MacMurray consistently disdainful of Bogart. He smirks when Bogart speaks and gives meaningful glances to other cast members. MacMurray sells us faulty merchandise when he does this; he convinces us Bogart is a crackpot who is unworthy of help or sympathy. It is interesting, though, to compare the attributes MacMurray dislikes in Bogart with those of his own personality. For example, he has nothing but derision when Bogart clumsily sidesteps responsibility, but MacMurray’s sidestep is sublime. He’s dumbfounded when Bogart perceives a theft of canned strawberries, but perceives he himself to be a master of psychiatry. He ridicules Bogart’s cowardice, but proves himself to be just as skittish. Like Bogart, MacMurray operates under the assumption that he has everything under control. He knows what he’s doing, and we believe him. After insisting Johnson stage a mutiny for the better part of the movie, MacMurray is suddenly vague during the court martial. Oh no, he never speculated about Bogart’s mental state. He had no idea what was really going on. After all, wasn’t he shocked – shocked! – to learn Johnson had taken control of the Caine? MacMurray offers a perfect portrayal of a man who doesn’t think he’s a bad guy. He’s just someone who’s looking after Number One; others can tidy up the resulting mess. 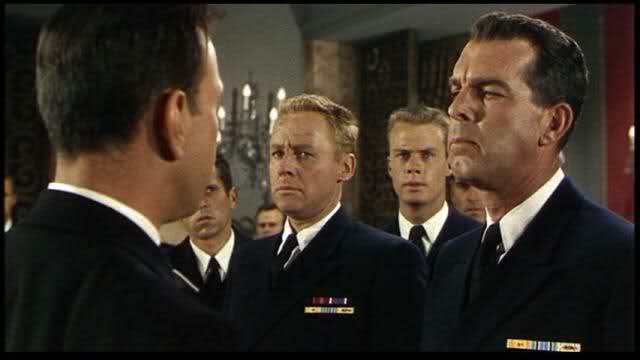 The Caine Mutiny is a fascinating film with a lively script and a fabulous cast. In our opinion, it bends the traditional notions of villainy in a shrewd way. 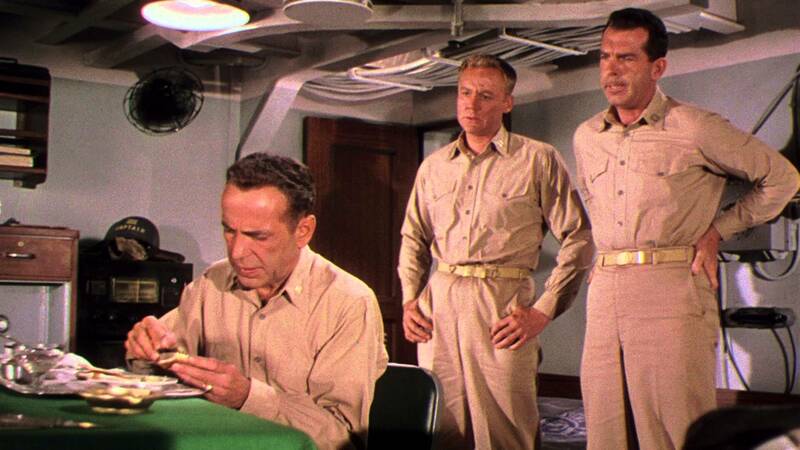 The Caine Mutiny: starring Humphrey Bogart, Jose Ferrer, Van Johnson. Directed by Edward Dmytryk. Written by Stanley Roberts & Michael Blankfort. Columbia Pictures Corporation, 1954, Colour, 127 mins. Excellent, clear-eyed look at a perpetually fascinating film and its main themes and characters. “The Caine Mutiny” played me big time the first time I saw it. I fell for Keefer’s blarney and felt truly chastised by Greenwald. I have also seen more people who behave like MacMurray/Keefer in real life than possibly any other fictional character. He’s a mundane, everyday villain – the self-deceiver. Me too! Greenwald’s speech at the end feels like a punch in the gut. It is such a smart script that you don’t realize how it’s toying with you.. It’s a film I never tire of. MacMurray plays one of the slickest villains ever, especially since the reveal is so unexpected. It also makes 2nd and 3rd viewings of the movie compelling, as you watch for clues that you missed the first time around. You definitely nailed the narcissistic quality of his character. Yes, I remember the first time I saw this film, I actually gasped at MacMurray’s reveal. And then I felt so dumb because it was so logical. Ha ha! I think that “four ways of doing things” saying is great. I might start using it myself. And thanks for co-hosting such a fun blogathon Ruth! Ain’t it the truth! A guy like MacMurray’s character can always find someone else to blame, no matter what the circumstance is. I only saw this once, way back during my video store days. Looks like I may have to revisit it. I know MacMurray was thought of as a comedy actor, but I much prefer his dramatic work. I like MacMurray in comedies but, like you, I prefer him in dramatic roles. He was really talented. Thanks for dropping by! Very nicely written. The only part of this movie I’d ever seen was when Bogie is being questioned and he keeps rattling those steel balls in his hand and carrying on about strawberries. I didn’t realize that MacMurray was the real villain of the movie. Much fun to read! You’ve got to see the whole thing. Of course, I’ve completely ruined the ending for you…but you still have to see it! Fred made such a good baddie – something shifty in the eyes. Excellent post and a great choice for a movie villain (the slimy skunk!). Ha ha! Fred was a slimy skunk in this one! I never tire of his performance in this movie. What an interesting post! I wish I had the movie to watch right now. I love how you compared Fred MacMurray and Bogart to each other to examine how similar they actually were in their villany. I’m just sad that MacMurray was the bad guy. I always liked him! :) Can’t wait to see it. Thanks, Ruth! Yes, it is a shock and a disappointment to discover Fred MacMurray is the real villain. Of course, now that I’ve ruined the ending for you, you won’t have the same experience. I know what you mean about Fred MacMurray. He is a charming, likeable person on screen and is always great in comedy. However, he is really, really good in this role. I hope you get the chance to see it. There are a lot of good messages in this film. Been a long time since I watched this so I have to revisit it, but can agree that Fred was a fine actor who could pull off this kind of role by playing on his charm and decent persona– those make the best villains in my opinion since you never see it coming. Loving the posts so far, and you sure picked a good one! For sure! You don’t see it coming with someone like Fred – in the movies or in real life, sadly. This is a great movie, one I need to rewatch. Love your choice of villain. Thanks so much! This is a great film, isn’t it? The casting is brilliant, as is the script. Thanks for dropping by. Ha ha! Yes, the toast with Jose Ferrer is a great scene. Very well done! Yes, Robert Francis was quite young when he died, wasn’t he? I’m not a huge fan, but he did very well in this film. He was convincing as an eager young military graduate. I saw this a year or two back and was also really surprised by MacMurray’s double dealing – Bogart is also fantastic in a part which really isn’t what you expect from him either. I felt they were right to take over the ship, but maybe I’m wrong… after reading your review I will have to go back and watch it again! The takeover of the ship is a tricky issue. It really looked like they needed to do something or else they would perish in the storm. However, I do feel they were wrong to rebuff Humphrey Bogart when he asked, in his awkward way, for help. I’d be interested in hearing your thoughts if you do see this one again! Fred was/is such an underrated actor. I guess a dozen years of My Three Sons will do that to someone’s rep as a dramatic actor. Which is unfortunate, as he is so good in this (and so many other dramatic) roles. You know, I’ve never seen My Three Sons because I’m afraid. It’s a case of “how the mighty have fallen” – kind of like watching made-for-TV movies with former big-name celebrities. I agree Fred was a really good actor, and this film is one of my fave Fred roles. I saw some episodes on TV Land or something similar. Probably 15 years ago? It wasn’t bad for that type of show. And, you know, I don’t think of this is as a “how the mighty have fallen” situation. I mean, it was on for a dozen years and was wildly popular. That is a huge success by any standard, and it made him way more famous than he had been. I just think it is a shame that when you say his name, the first and likely only thing people think of is “My Three Sons” (or maybe The Shaggy Dog/The Absent-Minded Professor/Son of Flubber). My husband grew up seeing MacMurray on the later episodes of My Three Sons so whenever we happen to see him play a baddie, as in Caine Mutiny, we tsk tsk at him. 🙂 Enjoyed your look at his character in this film. You know, I’ve never seen My Three Sons, but I’m going to see if I can find it on Netflix or clips on YouTube. MacMurray was always great in comedies, but I really like him as a dramatic actor. So the comic relief turns out to be the bad guy. Interesting, I haven’t seen ‘The Caine Mutiny’, but would love to check it out. You had me at mentally-unstable Bogart, who seems to be the anti-hero at the beginning. Oh yes, I really like Bogart in this one. He is definitely the anti-hero, and really unstable. It’s one of my fave Bogie performances. I hope you get a chance to see this one… Hopefully I haven’t ruined it for you! Even though you’ve given away twist, no not really. There is so much more to watch out for in classics, than just the story. 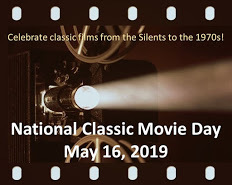 Although when it comes to modern day films, quite a few (not necessarily all), if you know the whole story, there might not be much worth watching.